This morning, the Bureau of Economic Analysis released data on Gross Domestic Product (GDP) by Metropolitan Area for 2017. 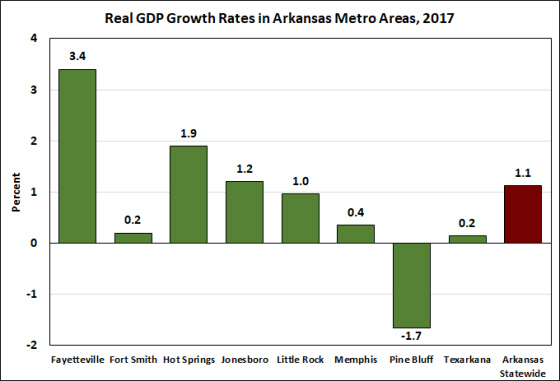 Among metro areas covering parts of Arkansas, Northwest Arkansas (Fayetteville) saw the most rapid growth (up 3.4%) while Pine Bluff fared the worst (a decline of 1.7%). Three of the eight exceeded the statewide growth rate of 1.1% but Fayetteville was the only metro area in the state to outpace the nation’s growth rate of 2.1% . The data for Metropolitan Areas generally show a great deal of variability from year to year, and are subject to substantial revision. 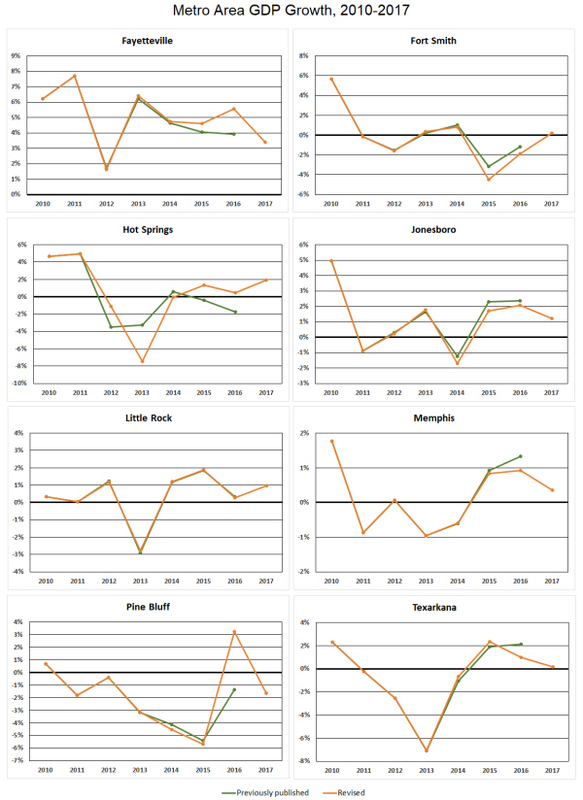 Today’s release included data revisions dating all the way back to 2001, but there were no revisions of any substance in Arkansas prior to 2010. The table below shows how the revisions affected estimates of growth rates in 2016. Fayetteville saw an upward revision from 3.9% to 5.6% and the growth rate for Hot Springs — which initially showed a contraction of 1.7% — was revised up to a positive growth rate of 0.5%. 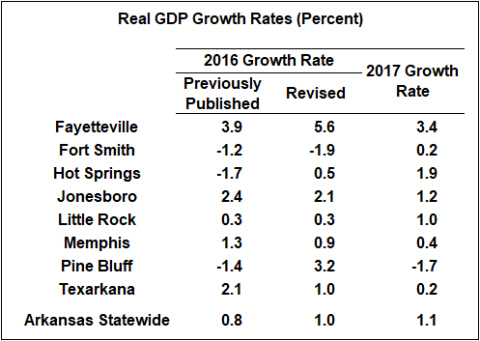 Even more dramatically, the 2016 growth rate for Pine Bluff was revised from -1.4% to +3.2%. Data for other metro areas showed relatively modest downward revisions. The figure below shows the previously-published and revised GDP growth rates for 2010-2017. 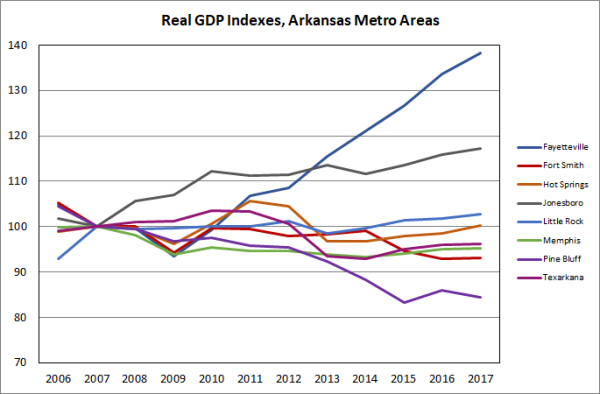 In addition to showing the magnitude of revisions to recent data, the figure also displays the differences in growth patterns that have emerged among Arkansas’ metro areas over the course of the decade. Fayetteville has shown positive growth every year, while the economic expansion in other metro areas has been interrupted by at least one year of contraction. Declines have been particularly large and/or persistent in Fort Smith, Pine Bluff and Texarkana. The cumulative effect of these growth patterns is that GDP in half of the state’s metro areas remains lower than the previous cyclical peak (2007). As shown below, the cumulative 10-year growth rate for Fayetteville is a remarkable 38% — even after accounting for the sharp decline that took place over the 2008-09 recession. The recession left Jonesboro essentially unscathed and steady growth since has resulted in a cumulative 10-year expansion of over 17%. On the other hand, the 10-year growth rates in Fort Smith and Pine Bluff are -7.0% and -15.5%, respectively. A broad measure of a region’s productivity is its output per resident: Real GDP per capita. 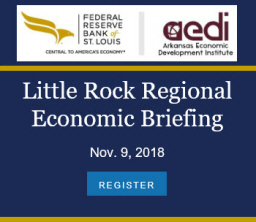 Measured in constant, inflation-adjusted 2009 dollars, GDP per capita in Arkansas was $36,714 — about 72% of the U.S. average of $51,337. 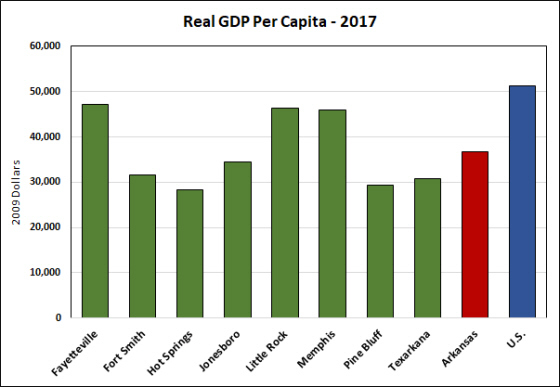 Fayetteville, Little Rock, and Memphis all had per capita GDP amounting to 90% or more of the national average, while the state’s other metro areas had considerably lower levels of output per person. Hot Springs had the lowest GDP per capita — $28,274 or about 55% of the national average. Real GDP per capita also provides an informative decomposition of GDP growth: A region can be experiencing overall economic growth due to population growth or productivity growth or both. 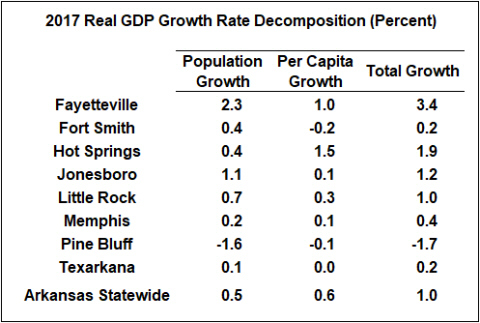 As shown in the table below, population growth was positive in all metro areas except Pine Bluff where an overwhelming share of the total decline in real GDP was associated with an outflow of people (although output per capita also declined). In Fort Smith, GDP per capita declined, but an increase in population drove total output growth into positive territory. In other metro areas, population growth and productivity growth went hand-in-hand in 2017.